Copper is distinguished by its colour… that glint of pink, bordering on beige, bordering on orange. It has some other interesting characteristics, too. * It is an excellent conductor of heat and electricity. That is why it is used in electrical wires, and for cooking pots. * It doesn’t spark. In industries where flammable materials are nearby, non-sparking bronze tools are used instead of iron or steel ones. * It does not corrode easily. This makes it a safe metal to use to carry our domestic piped water. * It is antimicrobial. The legionella bacterium (which causes Legionnaire’s disease) cannot thrive in copper water pipes. Copper worksurfaces are more hygienic than steel ones. * It is non-magnetic. For this reason, bronze tools are used for working with delicate electronic instruments, such as in the computer industry. * It is recyclable. Since the earliest times, copper items have been melted down and re-made into new ones. About 40% of the copper in use today is recycled. So your trowel may once have been part of a Roman Centurion’s breastplate. Bronze is a copper alloy – mostly copper with a little tin. 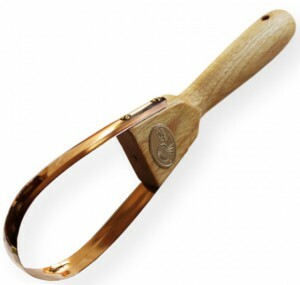 The Nunki Weeder is bronze (95% copper). The extra tin gives it the sharpness – and the orange colour. The Maia Dibber is pure copper, a pinkish colour. The tools are made of various copper alloys. In its pure form, copper can be beaten or moulded into complex shapes without cracking, or spun into wire as fine as human hair. Combined with small quantities of other metals, it retains some or all of these qualities, but forms alloys of greater hardness. Brass, an alloy of copper and zinc, has a yellow colour. It is even more ductile than pure copper, and is also harder and stronger. It is used for the collar of the Pegasus Pick and the frame of the Hydra Swing Hoe. Bronze, copper alloyed with a small quantity of tin, is harder still – up to four times the hardness of pure copper. It is used for the blades of all of our tools. It was the first alloy to be created by humans. It has a slightly more orange colour than pure copper, which has a pinkish hue. Iron is hardened by heat. Picture a blacksmith’s forge, with the iron heated to white heat before it is hammered into shape. Copper and its alloys, on the other hand, are weakened by heat. So our larger tools are hammered when cold (known as work-hardening) to strengthen them. You can clearly see the hammer marks on our spades. When they burn, the two metals give off different colours. When oxides of iron burn, we see red and orange. With copper we see blues and greens; the other end of the spectrum. Iron is magnetic, copper is electric. Copper is used in electrical wiring. Metallic iron does not last long in the earth’s atmosphere. All the iron and steel we use has to be smelted from ores. The noble metals (copper, silver and gold) can exist in pure form in the earth. * A function of copper in the human body, and plant metabolism, is to do with energy transfer. * Dowsers have been able to detect a drain of energy near where iron stakes are placed in the earth. No such effect occurs with copper. * Many people find that wearing a copper bracelet helps to ease rheumatic pain. * Door handles, light switches and other frequently touched surfaces in one ward in a UK hospital have been replaced with brass fittings to reduce the level of hospital acquired infection. * And here is a more recent article on the same theme. * The US Environmental Protection Agency has now registered copper as an antimicrobial material. It is the first solid surface material to receive this registration. We have produced a small booklet which goes into more detail about the curious duality between copper and iron, the effect of using copper or iron tools on the soil, and the significance of copper in history and mythology.